Believe it or not I’m not quite sick of winter yet. Ask me next week maybe, but for right now it’s still OK. It has seemed awfully long, and we even got a few more inches on Saturday, but part of me knows that as soon as the weather warms up then we’re back outside and that means more work for me, keeping the outside maintained as well as the inside. Phew… it makes me tired just thinking of it! So let it snow let it snow let it snow! Well for a few more days at least. 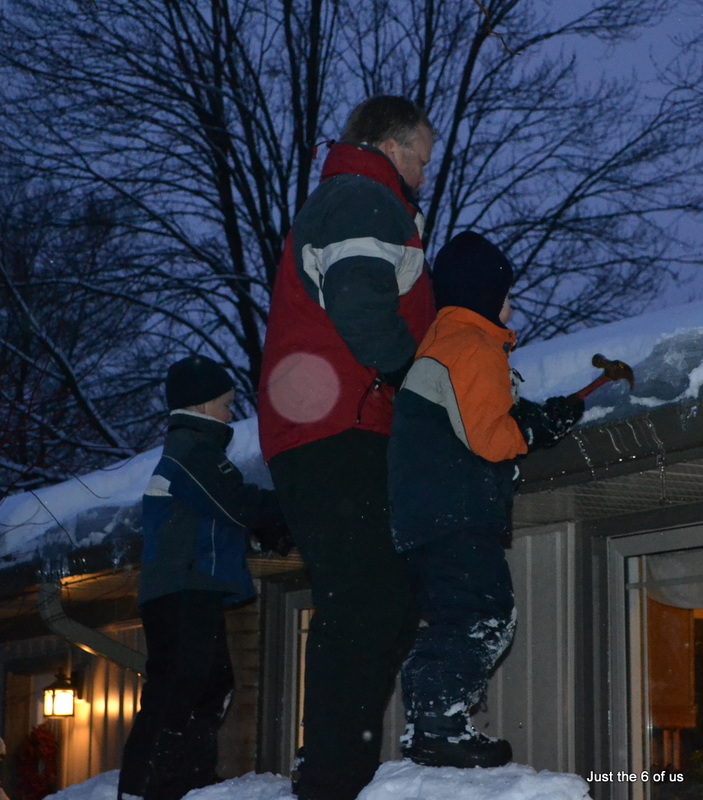 There are some down-sides to this weather, such as the ice that’s building up on our roof – it’s not well insulated in front of our sky-lights, and it was getting rather big, so when Jason started chipping away at it last night, the boys just had to help. And yes, they are standing on our front porch on about a 5 foot pile of snow. Jason keeps sweeping the snow off the roof and this pile keeps getting bigger and bigger and the kids love it. Soon it will be so big they will be walking unto our roof, well I hope not, I can’t see that going well. Friday both boys were off school as they were getting colds and they had stuffy noses and Erik had a sore throat and I’m a push-over. It actually worked out well though because my mom “Oma” came down and spent the day with us. It was so nice to have her here and she gave me the chance to get out and do some shopping for a few hours, hurrah!!! 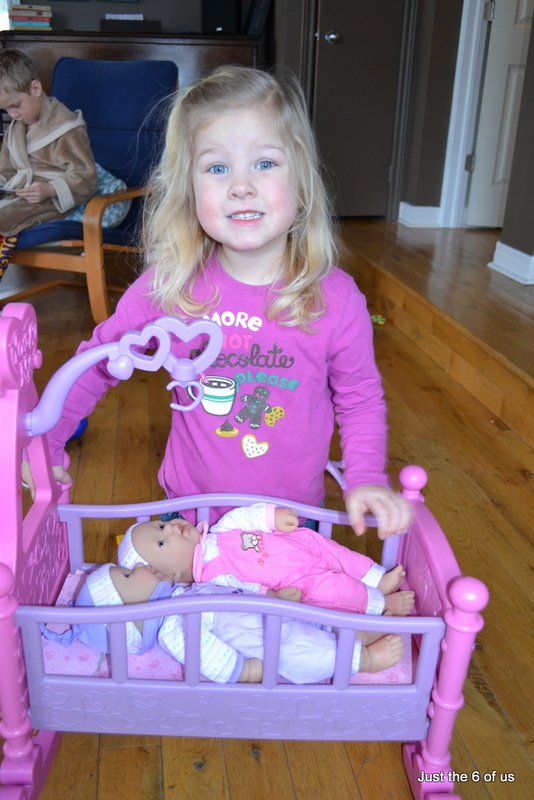 And mom brought Sarah her birthday presents – twin dolls. Mom has a set at her house and Sarah just loves them so she was pretty excited to get her own ‘twins’. Sophy loves them too so there has been a few tug-of-wars already, but Sarah can’t stand to see Sophy sad so she eventually gives in and lets her have one. I think Jason’s a little disgusted at how many dolls we have now. I think he figures that one doll each should be enough, but that’s just not the case… every little mother needs at least a dozen! Being the only girl growing up, I think I had a about 9 or 10 dolls and I loved them all. So how did my children entertain themselves on this day away from school? It was the funniest thing when mom and I realized that up in the boy’s room Erik was explaining molecules and matter to his ‘students’… they were playing school! William was the teacher and librarian, but Erik taught science and gym. And Sarah was the student… probably not a grade ‘A’ one. 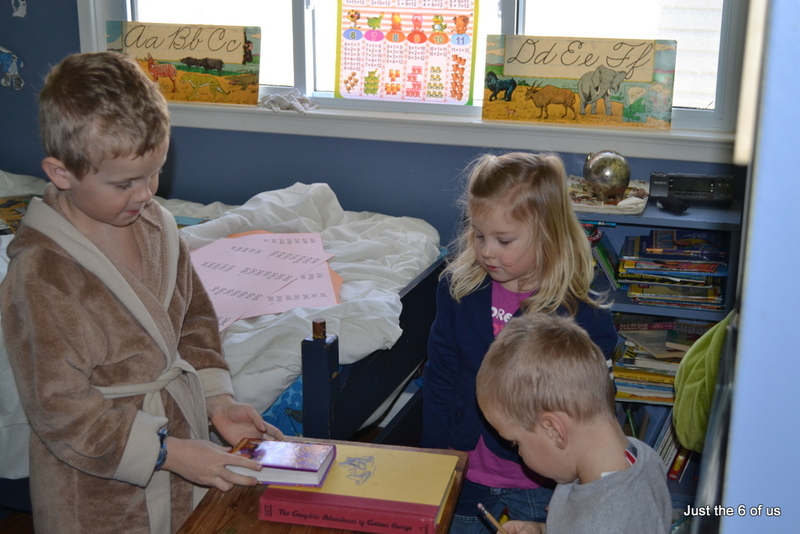 Here are Erik and Sarah checking books out from the librarian. As you can see Erik isn’t dressed, I have no idea what he has against getting dressed, but if he has an excuse to stay in his house-coat all day, he’s all over it. Oh – and one more thing. You know how you sometimes hear yourself if your kids? Well Sophy’s latest addition to her vocabulary is ‘right now’ said with exclamation. I think she must think that’s how it’s supposed to be said, because she’s just copying me… oh yes, I have been guilty of say thing things like, “It’s time to go, get your coat on RIGHT NOW!” and “Come put the cushions back on the couch RIGHT NOW!”. So now when she’s calling from her crib, it’s “Mama, right now!” – just what you want to be hearing from your baby.